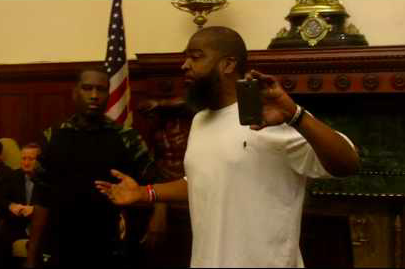 Protesters disrupt press conference at City Hall on August 7, 2017, to demand justice in the June 8 shooting of David Jones by a Philadelphia police officer. Amid mounting protests against the handling of an officer-involved shooting in June, Philadelphia City Council President Darrell Clarke announced Monday that the investigation of David Jones' death will be handled by the Pennsylvania Attorney General's Office. The decision came hours after Black Lives Matter Pennsylvania's Asa Khalif and Jones family representative Isaac Gardner interrupted a city press conference to reveal Philadelphia's new waste reduction plan. The two have confronted multiple city officials over the past week to demand transparency and justice. Jones, 30, was fatally shot on June 8 after a Philadelphia police officer stopped him for illegally driving his dirt bike "in a reckless manner" near the intersection of Whitaker and Hunting Park Avenues. The 15th District officer, identified by police as Ryan Pownall, was transporting individuals to the Special Victims Unit when he pulled his vehicle over to question Jones, authorities said. Pownall felt a gun in Jones' waistband during a pat-down and immediately drew his own weapon, leading to a struggle between the two men. Police said that as Jones broke away from Pownall, fleeing down Whitaker Avenue, the officer removed his weapon and attempted to fire at Jones. His gun did not discharge. Pownall then cleared the stoppage and fired several shots, fatally striking Jones in the back. The case has received deeper scrutiny because Pownall, a 12-year-veteran of the department, previously shot a fleeing suspect in the back in 2010, causing medical problems that left the man paralyzed from the waist down. An eyewitness account of the Jones shooting, published by PhillyMag a few weeks after the incident, also surfaced multiple discrepancies in the account of events offered by police. In the aftermath of the shooting, Philadelphia Police Commissioner Richard Ross said surveillance video of the incident "gives me pause," but Ross deferred to comment further pending the outcome of a complete investigation. Pownall, who was placed on administrative leave, remains a member of the department. Any time a police officer is involved in the shooting of a civilian is cause for a timely and diligent investigation. Because of the circumstances in which Mr. Jones was shot and killed, including conflicting witness accounts and the troubling fact that he was shot from behind, we need a thorough investigation. The Philadelphia District Attorney’s Office has referred this matter to the Office of the Attorney General due to a conflict. The OAG has taken over this investigation. I am confident Attorney General Josh Shapiro will conduct a thorough and fair investigation into this matter. On behalf of City Council, I extend our deepest condolences to those who mourn Mr. Jones. People knew this man, loved this man, and had hopes for his future. His death and the weeks following have been painful for all parties involved. The pain being felt by Mr. Jones’ loved ones must be honored and respected, no matter the outcome of this investigation. We must also respect our passionate fellow citizens who are demanding justice in this tragedy. And we must never forget the victims of the hundreds of shootings that occur in Philadelphia every year. I look forward to the timely resolution of this investigation, and to seeing justice for all parties involved. Below is a video of Monday's protest at City Hall.